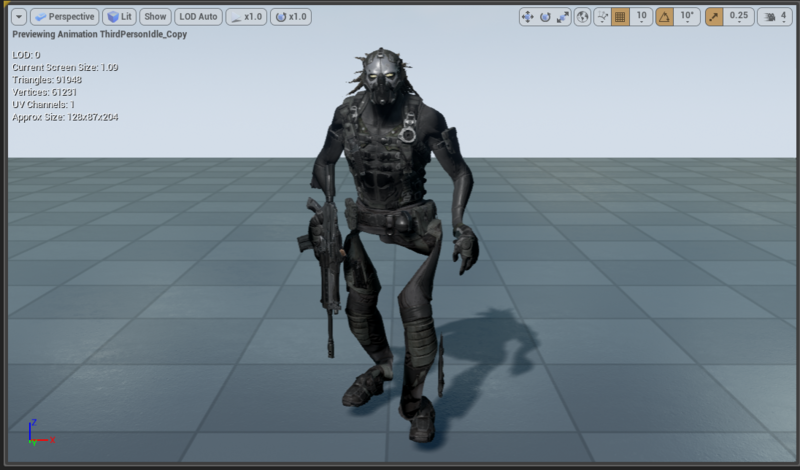 i followed this Wes Bunn tutorial about Skeleton Asset and after this i tried to retarget the Infiltrator demo skeleton to the UE4 Mannequin Skeleton. Opened the Infiltrator skeletal mesh. Clicked on the Retarget manager. Matched up every single bone and twist except for the IK ones. If you were matching to an A-Pose skeleton, clicked "View Pose" and then moved/rotated the proper bones to match an A-Pose. Clicked "Save Pose" Went through the rest of retargeting the animations by using "Duplicate and retarget anim assets" from the right-click menu. Any idea on where is the problem and how to solve it? plus a recursively set translation retargeting skeleton on both shoulders and thighs. No, that doesn't fix anything. The problem is that the skeleton is shared by multiple meshes. For some reason, they're in different poses. (These were used in the tutorial) The SK_Infil1_Proto_Skeleton is in an A pose. However, the Infil1_Redshirt_SK mesh uses it. Can anyone help please?